This is an exciting time in your life. Your love for one another has led you to make this marriage commitment! When a couple is married “in the Catholic Church” we believe, as Catholics that the couple commit themselves to one another and make a marriage commitment to God and to the Catholic community. Marriage is not a private affair. In turn, the community and God commit themselves to support the couple in their marriage. This, in part, is why all marriages take place within the church building. Even more important, because the marriage covenant is grounded in faith and will only be successful lived in faith, it is essential that the couple be practicing and living their faith within a parish community. 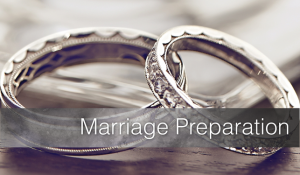 Because you as a couple and your impending marriage are so important, we start the marriage preparation with a meeting with one of the parish priests. To set your wedding date, please contact the Parish Office at 734-769-2550 a minimum of nine months before you are planning to be married. The Sponsor Couple Marriage Preparation Program uses “like-to-like” ministry to help prepare engaged couples increase their knowledge and awareness of each other’s values and attitudes as well as improve their communication skills, problem-solving abilities, appreciation of human sexuality, and the expression of their shared spirituality. Through this ministry couples who have been married for at least five years help to prepare engaged couples who are planning to receive the Sacrament of Marriage. This approach to marriage preparation allows a married couple to make a difference by giving engaged couples the strong start they need to have a successful marriage. Meetings are held in the home of the married couple. For more information on how you might become a Sponsor Couple, contact Marty Lucas at mlucas@stfrancisa2.org or 821-2125.